Intensity modulated radiation therapy (IMRT) is one of the most advanced methods of delivering radiation treatment today. At GenXRT, we are proud to offer this to our patients, and we're even more proud of the results this technique has enabled our patients to achieve. IMRT is a method by which individual beams of radiation are delivered with a variable amount of radiation intensity across different portions of the beam. Using our treatment planning systems, Elekta XiO and Elekta Monaco, every beam to be used in a radiotherapy plan is analyzed to determine which portions of the beam are most useful (i.e. those portions that hit the tumor and miss normal structures), and which are less useful. 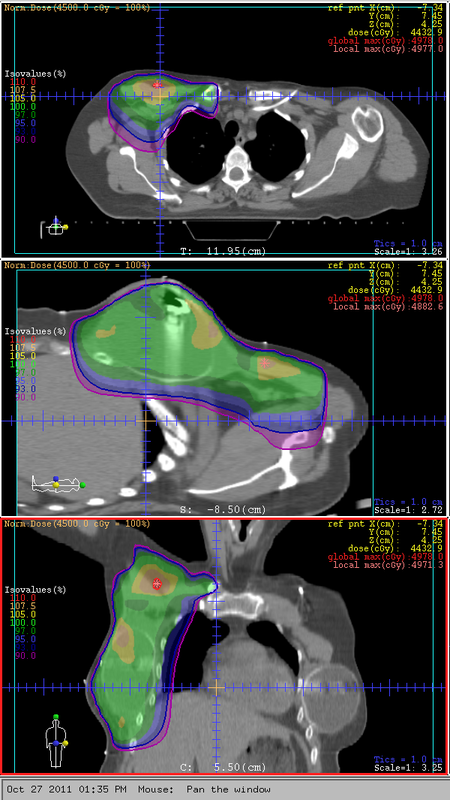 The beam's intensity is adjusted to maximize the amount of radiation delivered through useful portions of the beam, and minimize or significantly limit the amount of radiation that passes through portions of the beam that would contribute radiation dose to normal tissues in the patient's body. Using IMRT, there is never one perfect beam. Instead, our doctor, physicist, and dosimetrist chose an array of potentially useful beams, and the computer system assists us in determining how to modify (or "modulate") each beam's intensity to create a radiation plan that covers the areas being targeted, while minimizing dose to sensitive normal tissues. In addition to offering our patients treatment with IMRT, we also use other methods when appropriate, including 3-dimensional conformal radiotherapy, stereotactic body radiosurgery, and image guided radiation therapy. At GenXRT, the radiation oncologist is specially trained and board certified in his knowledge of which treatment method is best suited to a particular situation.